Spain has for a long time been a popular tourist destination for those in the UK and Ireland and includes the Balearic Islands, between Spain and Italy,and the Spanish Canary Islands, located off the north west coast of Africa. 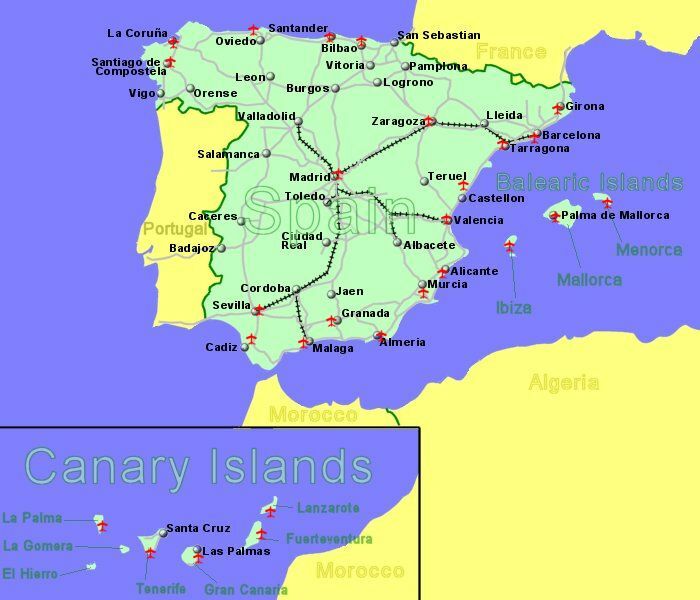 Being roughly due south of the UK, the flight times to Spain represent the shortest possible for a significant improvement in climate, while the Canary Islands are a winter fvourite. Spain, particularly the mainland and the Balearics, also has plenty of history, places to visit, and activities to participate in. 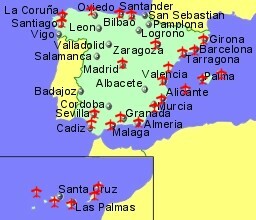 Practically all the International airports in Spain are run by the state owned company AENA (Aeropuertos Espa�oles y Navegaci�n A�rea), which translates to Spanish Airports and Air Navigation. Spain is a member of the European Union and the currency is the Euro. Spain is also a Schengen country. Located 9Km South West of Alicante on the Costa Blanca. Located 9Km East of Almeria, serving the Costa de Almeria. Located at Santiago del Monte, 47Km North West of Oviedo, 17Km West of Aviles on the North coast(Costa Verde). Located 10Km South West of Barcelona, giving access to the city, the Costa Brava and Costa Dorada. Located At Loiu, 12Km North of Bilbao, home to the Guggenheim Museum, and serving the eastern end of the Costa Verde. Located 5Km south of the capital of Fuerteventura, Puerto del Rosario, in the Canary Islands. Located 10Km South West of Gerona and 90Km north of Barcelona, on the Costa Brava. Located 18Km South of Las Palmas, on the island of Gran Canaria, in the Canary Islands. Located 15 km west of the historic city of Granada, well known for the Moorish Alhambra Palace, and 100 km south of Jaén, in Andalucia. Located 7.5Km South West of the city of Ibiza, near the southern tip of the Balearic island of Ibiza. Located 7Km South East of the city of La Coruna, in the region of Galicia, the North West corner of the country. Located 8Km south of Santa Cruz de La Palma, the capital of the Canary island of La Palma. Located 5Km south west of Arrecife, the capital city of Lanzarote, in the Canary Islands. Located 13Km North East of the city centre of Madrid, the capital city, with good access to the motorway system. Located 4.5Km South East of Mahon, on the South Eastern tip of the Balearic island of Menorca. Located 8Km South west of Malaga, on the Costa del Sol. Located 8Km East of Palma, the capital of the Balearic island of Mallorca, in the South East of the island. Located 5Km South of Santander on the Costa verde, in the Cantabria region, northern Spain. Located 17Km East of Santiago de Compostela, in the region of Galicia, north west Spain. Located 12Km North East of Savilla, the capital city of Andalucia. Located 60Km south west of the capital, Santa Cruz de Tenerife, serving the holiday destinations on the south of the Canary Island of Tenrife. Located 8Km West of Valencia, the third largest city in Spain, on the Orange Blossom Coast. Located 9Km east of Vigo, in the region of Galicia, north west Spain. Located 10Km west of Zaragoza, in the Aragon region of North East Spain.